I like to think that every cook has a culinary nemesis. A food item that you may love to eat but that the idea of actually cooking sends you into a cold sweat. You've probably tried on several occasions (depending on your patience) and whilst you may not have failed, you have not been 100% happy with the results. For some this might be baking bread. For others, pastry. I have a bit of a thing about rice. Maybe I am wrong - it is quite possible that I am the only one who experiences such insecurity in the kitchen. One of my 'issues' surrounds the baking of muffins. I adore freshly baked muffins. Blueberry, apple and cinnamon, bran and raisin, chocolate. Bring them on. All of them. At once. Such is my passion that I decided a few years ago that I simply must try to make my own. I found a reliable-looking recipe for raspberry muffins and away I went. 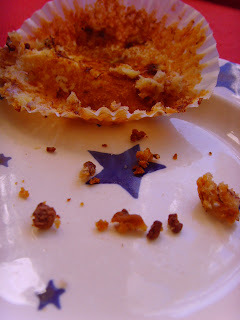 So sure was I of success that I even invited people round for 'elevenses' to enjoy my freshly baked muffins. Too cocky. The muffins were hopeless. They tasted fine. But there was nothing muffiny about them. They were, in short, raspberry cupcakes. I was upset. Very upset. One of my less attractive traits is that I am rather a bad looser. I like to get things right. First time. So upset was I with my muffin disaster that I resigned myself immediately to a life of purchasing (rather than baking) muffins. This was until Friday. I had a brief lie-in as I work from home on Fridays. I was up at 8ish and stumbled into the kitchen to make a cup of tea before hitting the desk... It was then that I spied them. A bunch of very sad bananas. Going blacker and blacker before my very eyes. Immediate action was required. 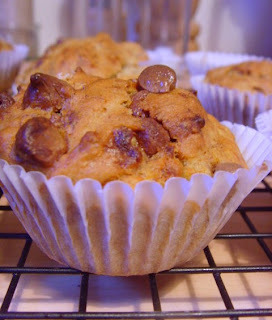 I simply had to think of some way to use up those overripe bananas. Banana cake? Usually, yes. But I had to start work and needed something quicker than that. I grabbed Nigella's Domestic Goddess book for inspiration. 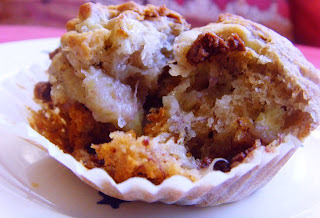 It just happened to fall open on the 'banana muffin' page. Uh-oh. I decided to bite the bullet and go for it. I had all the ingredients to hand and the instructions were so simple that I really couldn't fail. Plus I was able to knock them up and be at my desk by 8.30am whilst the muffins baked in the oven. And how were the muffins, I hear you ask. A partial success. Have, since my previous muffin disaster, read that the key to the perfect muffin is not to overmix the... mixture. Combine the ingredients with just a few gentle stirs. Apparently it does not matter if there area lumps of flour. It will, so I'm told, all come out in the wash (... or rather, in the oven. But you know what I mean). Well. I'm not so sure about this. As you will see from the pictures, some rose much better than others. I can only assume that the bicarb and baking powder were not evenly distributed due to required half-hearted mixing. Clearly I should have thoroughly mixed the dry ingredients first and then mixed everything together lightly. 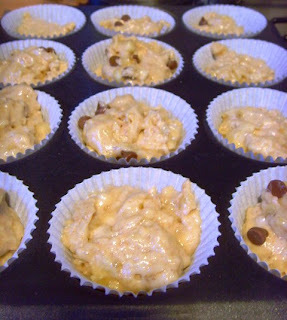 Secondly, my 'muffin' tins are not really 'muffin tins' at all. More like... mince pie tins. I think I should have used a deeper tin. I'd be grateful for any tips though. The good news? They did have the right texture. And they were delicious. I am therefore prepared to give muffins another whirl - can anyone tell me where I am going wrong?! Here is the recipe. 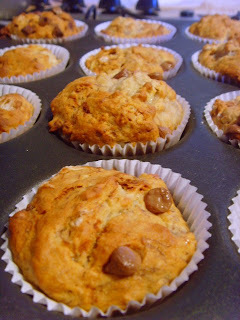 I added some milk chocolate chips to half of the muffins - just because I couldn't think of any reason not to! 2. Place butter, honey and vanilla into a small saucepan and melt gently. Set aside. 3. Mash the bananas - add the butter and honey mixture to the bananas and mix together. 4. Mix together all the dry ingredients in a separate bowl. 5. Add the wet mixture to the dry mixture and combine lightly. Do not overmix - it will look lumpy and sludgy, but do not worry! 6. Put paper muffin cases into a 12-bun muffin tray. Fill the cases about 2/3 full. It will seem like you don't have enough mixture for this. You will. Honestly. 7. Bake for 25 minutes, until they are nicely browned on top. Remove from oven and cool in tray for 5 minutes before transferring to a wire rack until cool. I think that those muffins look delicious. as for tips...I think you already said it - mix the dry ingredients thoroughly before mixing it with the wet ingredients. 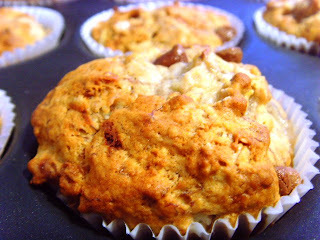 I always make two sizes of muffins - small ones like yours and I also have a "texan-size" muffin pan for bigger muffins. As for getting the "perfect" muffins, I think that it's varies according to personal taste, so I say, keep trying different recipes till you find one that you like. As you said, it usually does not take long to whip up. Good luck! Alas, my muffins have a tendency to be nothing more than big cupcakes. Any time they do reach the required size and texture, it's more down to luck than design. So no help, but yours do look good anyway. BTW, Katy (my 7 yr old) told me to tell you that she likes your starry plates. Nora - thanks for the tips. I think you are right - I should try a few more recipes. I really liked the texture of these ones, so I may try again, being sure to thoroughly mix the dry ingredients first! Lynn - Glad to hear that it is not just me! Say hello to Katy from me - I love anything featuring stars. I also have starry glasses! I think you've over come your nemesis your muffins look amazing!! When I make muffins I give the dry ingredients a good mixing. I also try not to over mix when I add the wet to the dry ingredients leaving the texture a little lumpy. I made some banana muffins last week and they were hopeless! I think I will try this recipe next time because yours look yummy! I had a wild thought that you looked like Dame Edna for a second, before I realised that you meant drinking glasses!!!!!!!! I haven't had any success with huge puffy muffins either, but they have all tasted good so far! One recipe, that I haven't used for a while (for blueberry muffins and I have missed the season), called for double sifting of the flour and they were always light. But generally I don't think it matters as long as they taste good and are light! A particularly good Nigella muffin is from her new book. Pear and Ginger Muffins. These don't puff up much, just about the same as yours. She calls them breakfast muffins, so I don't know if that means they are of denser quality, but they are lovely! I think they look wonderful. So well domed and with banana and chocolate... I can't say no! Rosie - I also struggle with rice. I hardly ever cook it - when I do it turns out fine, but I seem to have it in my head that it will be a disaster! Margaret - these were delicious, I have to say. Do give them a try and report back on the results! Lynn - No, not a Dame Edna look-a-like. I did mean drinking glasses!! Holler - thanks for the tips - I shall try the double sifting of the flour. And you are right, of course, as long as they taste great, who cares if they aren't hugely puffy. Those pear and ginger ones do look gorgeous. I had spotted them in the book and wondered about trying them. Patricia - thank you! If only I had any left! I'm your Blogging by Mail "buddy". I thought I would investigate your blog to learn more about you. My cooking "nemesis" is Indian food. I love it but it intimidates me. Lisarene - welcome! Thank you for stopping by and I can't wait to receive your parcel - blogging by mail is such a great idea. I love Indian food too but hardly ever cook it - I get a little overwhelmed by the number of ingredients but I'm getting much better and giving it a try! 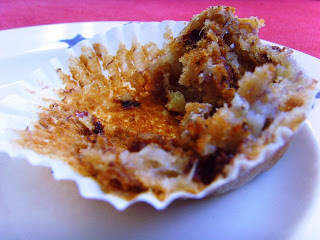 Hello Antonia - I just made some muffins tonight and they came out a bit flat on top, so I was poking around the internet to see where I went wrong, although they did taste really good. I added pistachio, hazelnuts and maple syrup. I think you must be right about the double sifting - also I need a proper muffin pan! My tip for you is about the rice - buy a rice cooker. A Chinese friend suggested I buy one, and I thought, well, he should know! I have never looked back, I now have two! They are just the best gadget ever and both easy to use and, vitally, easy to clean!